John Singleton Copley is widely acknowledged as the finest portrait painter of colonial America. Born in Boston, Massachusetts, Copley was ten when his widowed mother remarried. Copley's new stepfather, a mezzotint engraver, introduced Copley to the study of art. After further training with Boston-based artists, Copley became a renowned portrait painter, painting such prominent figures as Paul Revere and Samuel Adams. Copley's paintings were distinguished by their honest but respectful realism, in contrast to the overly flattering portraits produced by traditional painters. Copley's painting of his half-brother Henry Pelham, a portrait also known as Boy with a Squirrel, was innovative for its day - a quirky portrait of a boy harnessing a squirrel on a string. Copley sent the painting to England where it so impressed two painters that they persuaded him to immigrate to London. Copley toured Italy before settling in London with his family in 1775. After just four years in England Copley was elected to full membership in the Royal Academy. 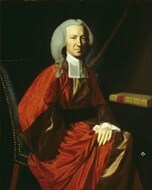 Afterward, he produced mostly historical paintings, which were held in higher regard than portraiture; nevertheless, it is Copley's portraits that form the basis of his reputation. Copley died in London at the age of 77.